Today, you have to assume a large percentage of people visiting your website are doing it on a mobile phone or mobile device of some type. Today, at least 37% of all website visits come from mobile devices and that number is growing fast. 80% of internet users own a Smartphone and there are over 4.6 billion smart phone users worldwide and again this number is growing fast. A good percentage of internet users also use tablets and game consoles and the use of Smart TV is also on the rise. There are now more Google searches from mobile devices than from desktop computers and that number is set to increase in the coming years. In fact, 48% of internet users start any research they make on a mobile device by using a search engine. 18% of Americans use payments on mobile devices and that number is expected to triple in 2016. Sales made to users on mobiles grew 38.7% in 2015 and the growth in this area will be huge. 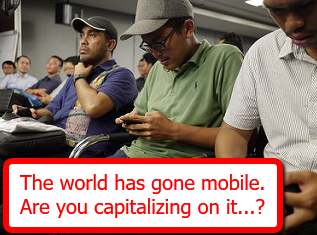 So what can you do to both make sure you’re not left behind and to take advantage of this mobile trend? 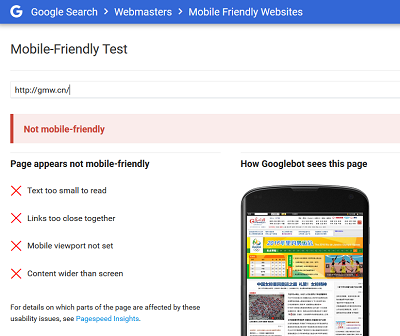 If your site is not mobile friendly, not only will you be losing visitors who are on mobiles, you can also get ranked much lower by Google. So it’s important your site (or a version of your site) works perfectly on mobiles. You also want to sure it works perfectly on every type of mobile device including iPhones and Androids. Munchweb.com is not mobile friendly at the time of posting, but that’s something being rectified. Over the past year we’ve pushed out a number of mobile initiative across our businesses, and the results have been solid. 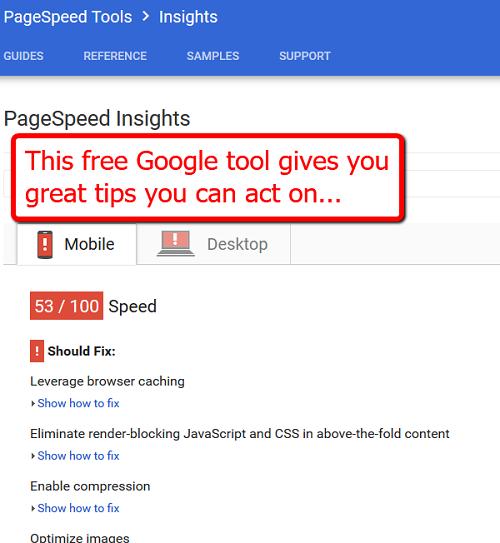 Slow sites cost you visitors and conversions and the speed a site loads at is part of Google’s ranking algorithm. Slow loading sites are penalized in the rankings by Google. Optimizing the the size and reducing the file size of images by compressing them. Editing elements off the page that have larger file sizes. Compress elements on the page where you can. Get rid of slow loading flash images. Compact CSS code on your pages to reduce its size. Compact HTML code on your pages to reduce its size. One method that is fairly easy to implement if your website is WordPress-based. You can install a cache plugin which will help improve loading times on mobiles. 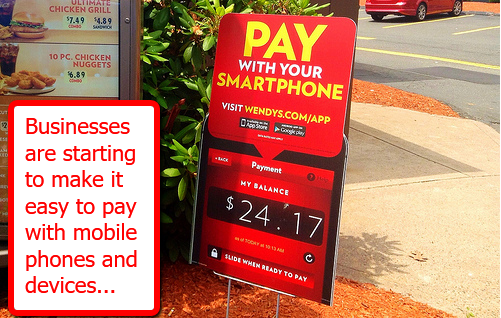 In the coming months and years, people are going to be using the mobiles much more to make payments. Expect it to become commonplace in many businesses within the next 2 years. Many of the users of your site will have an expectation that they can buy online using their mobile and when it comes to spending money with you, you don’t want to disappoint your visitors! To take advantage of this trend of buying using a mobile, make sure you have mobile payment options. 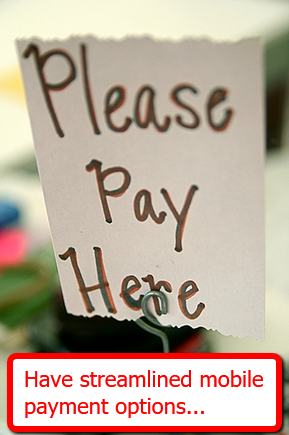 Also make sure your payment process works perfectly on mobile devices. 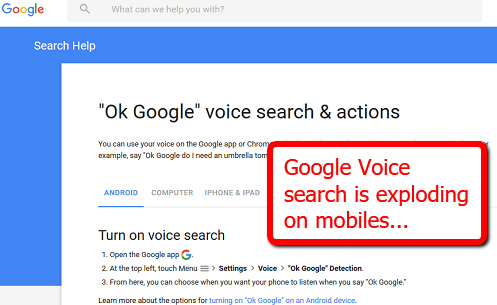 Google created Google Voice search specifically targeting mobile users. With the right browser or app, you can speak into your mobile phone, your Android or your computer and perform a Google search. You can speak a simple question like “How tall is the Eiffel Tower?” and you’ll get back Google results. People talk longer than they would if they were typing in a search so target longer tail keyword phrases. 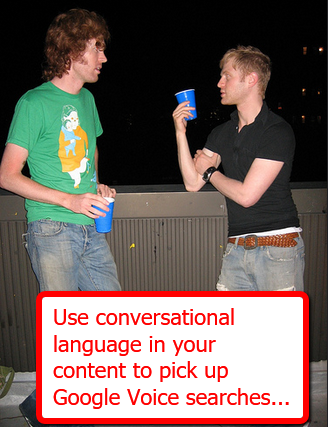 Use more conversational and less formal content on your site so your content is more likely to include phrases people might say when they’re doing a Google Voice search. Consider talking more about yourself and your experiences in the first person to pick up on first person type queries that are used more in Google Voice Search (words like “me”, “my” etc). Use Frequently Asked Questions (FAQ) pages on your website to pick up more of the long tail keyword phrases people using Google Voice search are likely to make in searches. 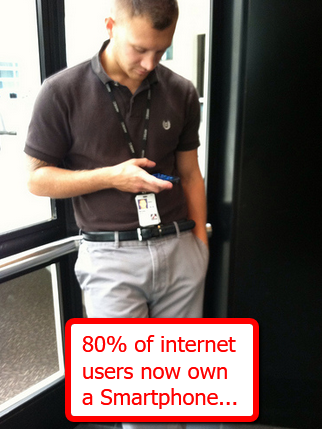 Remember that a growing percentage of people visiting your site will be on Smartphones or mobile devices. You want to make it as easy as possible for these visitors to link to your website when they’re using a mobile. Clickable buttons on your site that make it easy to share their comments or share the site on social media like Facebook increase the chance of getting both regular and mobile traffic. For example, Pinterest is used more by mobile users than any other social media. If it’s convenient to use on a mobile a social media platform is probably worth testing as part of your overall marketing strategy. Also if you’re advertising on social media or Adwords, remember you can target specific mobile devices. If you go down this route, it’s vital that you test your ads to be sure they work perfectly on the devices you target. One interesting fact is that people tend to be more engaged if they read an email on a mobile device than if they read an email on a computer. The click through rate for emails read on a mobile device is now sitting at around 55% compared to 26% for computer users. So there are opportunities for you for better engagement when your subscribers read your emails on a mobile phone or device. The biggest key here is to make sure the emails you send work perfectly on mobile phones and devices. 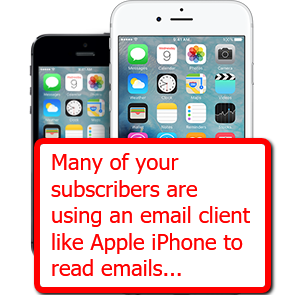 The most popular email clients at present are Apple iPhone, Gmail, Apple iPad, Android and Apple Mail in that order. You may want to become familiar with what emails look like on a mobile in each client so you have insights into how to write and format your emails to work more effectively for mobile users. SMS marketing (marketing by text to prospects and customers) is an emerging field that is very effective for some business types. If you have a local brick and mortar business or you have clients who have brick and mortar businesses, SMS marketing is something you may want to consider. 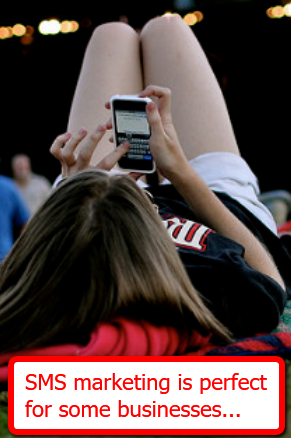 One advantage of text marketing is that at present, a high percentage of texts are read (much higher than email). And you can target prospects at the perfect time of day to get their attention. In some cases, you may be able to target based on where they are (for example a takeaway restaurant targeting ideal prospects who enter 2 miles of their geographic area. Text can also be used as a follow up to email marketing or in combination with other forms of marketing to increase their effectiveness. Well timed texts with targeted offers are also an effective way for businesses to get repeat business from existing customers. We’ve had great success getting more people on webinars using SMS webinars, and even built our own technology for that. We’ve seen huge growth in mobile usage online in the past few years and there is still a huge amount of growth to come both in mobile usage online and in making payments using mobile phones and devices. Right now is a great time to start ramping up your website to take advantage of this rapidly growing trend. How does this work? Is there a recommended service for sms marketing? Previous Previous post: 4 Crazy Online Business Ideas That Worked!